Here are photos Adam took during the field day on our farm during a past summer. The text is from an article in the Organic Broadcaster. Here, Dan leads the attendees out to the fields. On July 31st, Dan and Robin Mielke and their children Andrea, Adam and Amy of Rudolph, WI opened their doors to 75 - 100 visitors, offering a special opportunity to view the Mielke’s unique approach to farming and making a living from their produce and home industries. Liz Rose ( in the blue shirt, center), on behalf of WI OCIA Chapter #1 and MOSA, welcomes the visitors and begins the introductions. 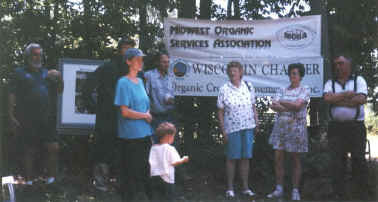 The field day was co-sponsored by WI OCIA Chapter #1, MOSA (Midwest Organic Services Association) and MOSES (Midwest Organic and Sustainable Education Services) and included a three hour walking tour around the farm lead by Dan, as well as a brief tour of the Mielke’s licensed kitchen. The Mielke’s are certified organic by MOSA for 3.5 acres of vegetables and herbs, as well as strawberries, raspberries and a 7 acre apple orchard. They also raise sheep, chickens for eggs and angora rabbits for fiber. Dan and Robin’s decision to go into farming came about as result of changes in their religious beliefs and their desire to live a different lifestyle. Included in their new way of life was the belief that they should not go into debt. Over the course of several years, without taking out any loans and with less than $10,000 a year annual income, the Mielkes were able to purchase Dan’s father’s 70 acre farm which had been in the family since 1860. They now own a total of 75 acres. Dan and his family continue to live as economically as possible, and have, at the same time, provided themselves with all the facilities they need to support themselves from the work they do on the farm. They have built their 5 bedroom house from recycled car tires and an old barn, they have constructed outbuildings and a greenhouse from used materials and they have gradually developed a number of different home industries, as well as markets for their produce. 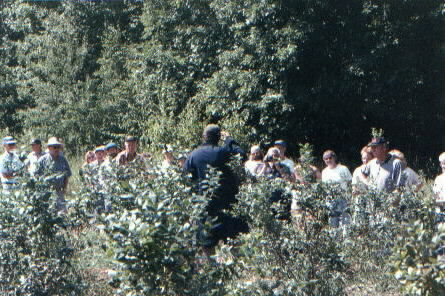 The tour of the blueberry patch. Daniel is in the center. The Mielkes intensively plant fruits and vegetables into small fields, approximately 30’ x 40’. They use a 60 h.p. Leyland tractor with a 48” rotavator to prepare their beds. Dan likes how thoroughly it incorporates organic matter and the uniform seedbed it makes. For planting, they use Earthway seeders or transplant by hand. Yard leaves from Stevens Point provide the gardens with a lot of high quality organic matter. The Mielkes run the leaves through a shredder to improve their quality as mulch. Air and water go through better and plants don’t get “collared” growing through a hole in a whole leaf. Lime and chicken manure are also added with the mulch 4 - 6 months prior to harvest. The Mielkes are now pasturing sheep in a future garden spot, thus helping to prepare the area by fertilizing it and keeping the weeds down. Dan credits the high organic content of their soil with saving this year’s crops. Situated in a low area, the main garden was wet for a lot of the summer, yet remained aerobic enough for most plants to thrive. During the garden tour, visitors saw beautiful potatoes, carrots, greens, onions and berry bushes. 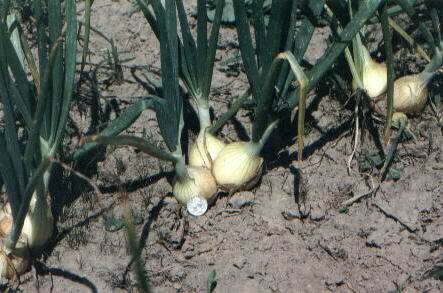 An abundant crop of very large garlic bulbs was hanging in the shed. 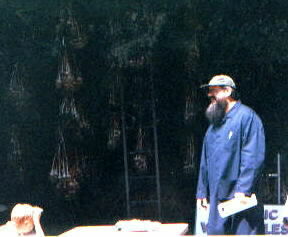 Daniel speaking by the garlic shed. "Don't get depressed, get a new idea!" Perhaps one of the best examples of this philosophy in action on the Mielke’s farm is their licensed kitchen. 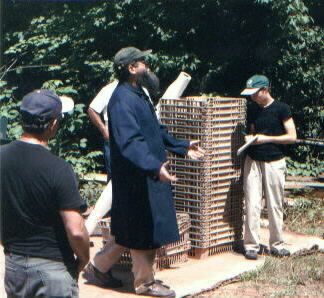 The Mielkes were forced to look into building a licensed kitchen when they heard that another farmer at the Steven’s Point farmer’s market had been prohibited from selling eggs because he did not have a licensed facility. Usually an expensive proposition, a licensed kitchen was not something the Mielkes had planned on. But after finding out about the requirements and talking to their local inspector, they were able to build a kitchen up to code at a cost of $400. The Mielke’s licensed kitchen now produces many value added products, such as baked goods and jams, which contribute significantly to the family income. Dan explained that their value added products bring in about two or three times as much as their produce at the farmer’s market. He also stressed the importance of learning exactly what the inspector wants before beginning construction of a kitchen, as different inspectors may interpret the regulations differently. Another aspect of the Mielke’s many-faceted operation is their fiber industry. They raise sheep whose wool Andrea, Adam and Amy spin and dye. Though prices for raw wool are low, prices for high quality yarn are high, again demonstrating the benefits of value added production. In addition, Andrea and Amy have developed a business selling knitted and woven goods and have obtained the necessary equipment for this by becoming sales representatives for the equipment manufacturer. Adam also became involved in the business when he found an antique sock knitting machine and learned how to use it. Adam got so proficient at using the machine that in 1999 he entered a nationwide machine sock knitting contest and won first place! 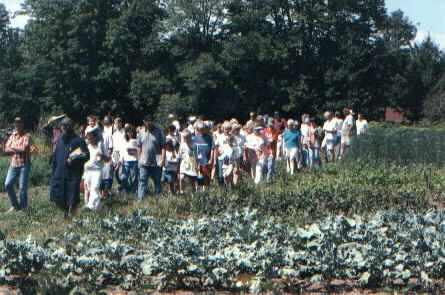 Another view of the crowd, with the strawberry patch in the foreground. •DNR abatement programs for crop damage by wildlife can work. Dan has had success working closely with his local DNR agent to develop an abatement system for their farm. 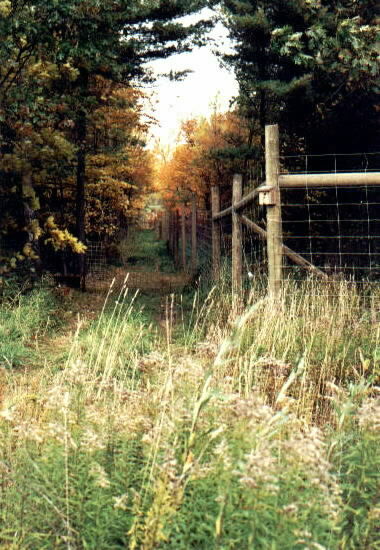 Their fields are now surrounded by an 8 foot high, New Zealand-type high-tensile woven wire fence which Adam and Dan built themselves, with major costs shared by the DNR. A section of the New Zealand-type high-tensile fence, put up around the crops for deer protection ( and, no this photo wasn't actually taken during the field day, but we thought you might want to see it anyways). •For potato bugs, the Mielkes shake them off the plants and into pails and feed them to their chickens, first pulling out any lady bug larvae and throwing them back into the potatoes because they eat potato bug larvae. •Eggplants are a good trap crop for potato bugs. Dan has found that the Neon variety, however, does not attract the potato bugs as much. •Jordan’s Seeds is a good source for inexpensive, untreated seed (be sure to request untreated seed). •Heavy mulch is recommended for blueberries. •Small crops can be profitable. For example, the Mielkes sell small amounts of chard each week at the farmer’s market. As healthy chard plants produce throughout the season, the crop becomes quite profitable per square foot in the long run. •Take chances by planting against the frost dates. If there’s a late frost, you’ll have the produce to sell, while others will not. •You can save a crop from a hard frost by building fires around it and at the center and keeping them going through the night. 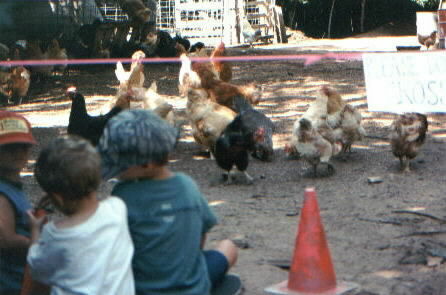 Some of the younger attendees watching our egg-laying flock. The Mielke’s field day was a fun and informative day for all in attendance. Some came just to visit their neighbor’s farm. Others came with specific questions and left with new ideas for experimenting and innovating on their own operations. Field days are always a special opportunity to learn and to enjoy good company. Thanks to all the Mielkes for their hospitality and for sharing their knowledge and experience with us! Reprinted with permission from the September-October 2000 issue of the Organic Broadcaster. And in the midst of it all (i.e. heat, 100+ people, water fights, etc. 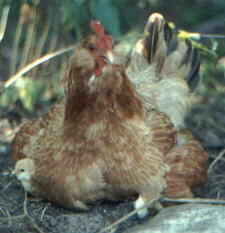 ), momma hen refused to move her brood from her chosen place in one of the rock gardens.